The town of Gilbert may have started out as a little agricultural Arizona community, but has since grown into a family friendly town continually attracting visitors and new residents. With so much traffic and food traffic going on, it is no wonder that asphalt maintenance and paving companies are in high demand. Roadrunner Paving & Asphalt Maintenance is a second generation paving contracting business providing top notch asphalt services for Gilbert streets, lots and residential areas. If you are looking for a paving contractor with experience, call Roadrunner Paving today. Snow might be a rare sight here in Gilbert, Arizona, but that does not mean that our driveways do not need to be in tip top shape. Imagine your cracked driveway during and after a monsoon storm! Aside from causing further damage, the monsoon rain can make your drive or walk way even more dangerous. Slipping and breaking a leg, is a real possibility. Roadrunner Paving expertly fills cracks and patches dangerous areas on sidewalks, entryways, residential roads and private driveways. No matter how big or small the job may be, we always bring our A-game. In addition to residential driveways, we have completed work on a vast array of commercial paving jobs as well. As your expert Gilbert paving and asphalt maintenance contractor, we know how to install, repair or perform maintenance work on your commercial parking lot, church yard, school yard and any other commercial. For over three decades, Roadrunner Paving has completed paving and asphalt jobs for government agencies, local business and school. If you need your school parking lot striped, or a pothole repaired, we are the ones to call. Followed Up With Me Several Times To Ensure The Project Went Off Without A Hitch! Great People To Work With A+. I Will Definitely Be Using Them Again! Over time, your parking lot in Gilbert can sustain a lot of damage. With the torrid heat of the Arizona sun, frequent wear and tear, and sometimes adverse weather conditions, it can be tough trying to keep your asphalt looking nice and fresh. With Roadrunner Paving, we can help maintain your parking lot and make sure that it lasts as long as possible. We can also provide excellent, quality parking lot paving and repair. No job is too big or too small for the professionals at Roadrunner Paving. Re-paving your parking lot or sealing large crevices in your existing asphalt is easy for our trained experts. Bring the appeal and beauty back into your parking lot with Roadrunner Paving & Asphalt Maintenance. Getting your parking lot paved by trained professionals is the first step to bringing the appeal and allure into your commercial residence. To keep your parking lot up to code with Arizona’s vast set of parking lot requirements, Roadrunner Paving can provide professional and beautiful striping for your lot. Making sure that your parking lot is maintained is a tough job, but it’s one that the experts at Roadrunner Paving are prepared to accomplish. With over three decades in business, Roadrunner Paving and Asphalt Maintenance is truly a professional Gilbert paving contractor. Locally owned and operated, we take pride in keeping the streets save on which our families travel as well. Gilbert residents in need of paving services, but lacking the equipment to do so, can count on the quality work performed by our expert road technicians. We have completed countless jobs all over the Phoenix Valley. A second generation paving contractor, David Slade proudly carries on his father’s tradition of providing top service at great rates. If you are in need of a first rate paving contractor in the Gilbert area, contact the team at Roadrunner Paving & Asphalt Maintenance today. We gladly inspect your project and give you a free estimate. Please remember us for your next patching, overlay, striping, or asphalt removal and replacement project. Naturally, we also fill and seal cracks. 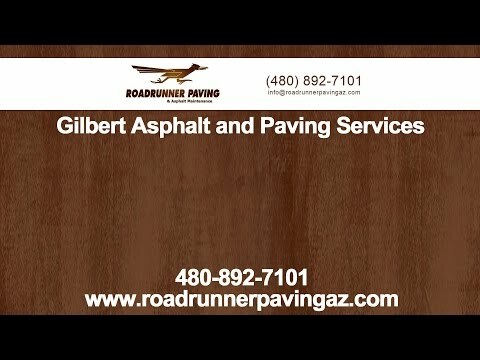 Contact Roadrunner Paving & Asphalt Maintenance today for your Gilbert paving needs. We offer top service and great rates. You can reach us at 480-892-7101 and visit us on the web at www.roadrunnerpavingaz.com to learn more about our paving services. See Ya Later Alligator! What Happened to My Gilbert Parking Lot?